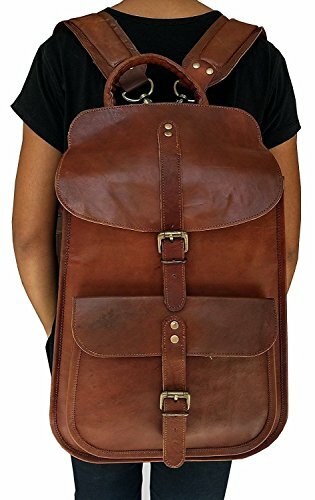 Key Features: • Brown Leather backpack • Ideal for school / college students , backpackers , hikers and picnics • fits clothing , i pad's , phones, chargers and water bottles • Spacious and light weight • adjustable shoulder straps • 2 external pockets and 1 internal zipper pocket • Dimensions: 5"(W) x 17"(H) x 12"(L) • padded base Additional Details: • Each leather product has a distinctive color tone, which may be different from shown images. Imported...!!!! Bag size - length (12) x height (17) x width (5) adjustable shoulder strap genuine goat leather best for collage and school you can use this bag as leather backpack, leather laptop backpack, leather collage bag, leather school bag, leather bags for men, leather bags for women etc. If you have any questions about this product by Leather Native, contact us by completing and submitting the form below. If you are looking for a specif part number, please include it with your message.